With Eye On Future, Billionaire Investor Bets On Paul It may seem like a long shot, but that's exactly what Peter Thiel invests in. The Silicon Valley venture capitalist, who co-founded PayPal and was an early investor in Facebook, has said his support for Ron Paul is the best chance for now to encourage a libertarian movement. Who are the wealthy Americans pumping millions into presidential superPACs? In the race for the Republican presidential nomination, only one candidate remains to challenge presumptive nominee Mitt Romney: Texas Rep. Ron Paul. Even Paul has said he will no longer campaign in states that have yet to hold their primaries. And Paul has always been considered a long shot to win. But that hasn't deterred many of his hard-core supporters, including the Silicon Valley billionaire who has bankrolled the superPAC backing Paul. Peter Thiel is a venture capitalist, entrepreneur and co-founder of PayPal. He hit the jackpot again when he gave Mark Zuckerberg the money to launch Facebook. Thiel's half-million dollar Facebook investment is now worth more than $1 billion. His success and his smarts have made him a virtual rock star in Silicon Valley. On a recent day at Stanford University, the lecture hall is full long before Thiel saunters in — light blue business suit, open collar, a Diet Coke in his hand, his eyes shifting nervously as he scans the crowd of mostly adoring undergraduates. He's come to argue a contrarian view: that technological progress is decelerating. "Whether we look at transportation, energy, commodity production, food production, agro-tech, nanotechnology — that with the exception of computers, we've had tremendous slowdown," he says. Thiel acknowledges that computers are getting faster, cheaper and better. But he says that's the virtual world of bits and bytes. In the real world of stuff, Thiel insists, there's been a slowdown. "I believe we are in a world where innovation in stuff was outlawed. It was basically outlawed in the last 40 years — part of it was environmentalism, part of it was risk aversion," he says. "And all the engineering disciplines that had to do with stuff have basically been outlawed one by one." In other words, he says government regulation stifles innovation and, without innovation, there is no economic growth. In technology circles, Thiel's libertarian views are well known. As a law student in the 1980s, Thiel co-founded the conservative Stanford Review, and he co-wrote a book critical of political correctness and multiculturalism on that campus. In more recent years, he's argued that higher education is failing America and that some of the brightest students are probably better off not going to college at all. That's why he created the 20 Under 20 Thiel Fellowships — a program that gives promising young entrepreneurs $100,000 to skip college for two years and create their own business, as he explained on All Things Considered last year. "I think anything that requires real global breakthroughs requires a degree of intensity and sustained effort that cannot be done part time, so it's something you have to do around the clock, and that doesn't compute with our existing educational system," Thiel said. "Had the people who started Facebook decided to stay at Harvard, they would not have been able to build the company, and by the time they graduated in 2006, that window probably would have come and gone." As a conservative, Thiel has donated money to a variety of Republican lawmakers. He's also Christian and gay, and he's a major donor to GOProud, a gay conservative group based in Washington, D.C.
Thiel's contribution of more than $2.5 million to the Endorse Liberty superPAC, which supports Paul, makes him the fund's largest donor — in spite of the fact that the two men have never met or communicated in any way. Thiel declined to comment for this report. 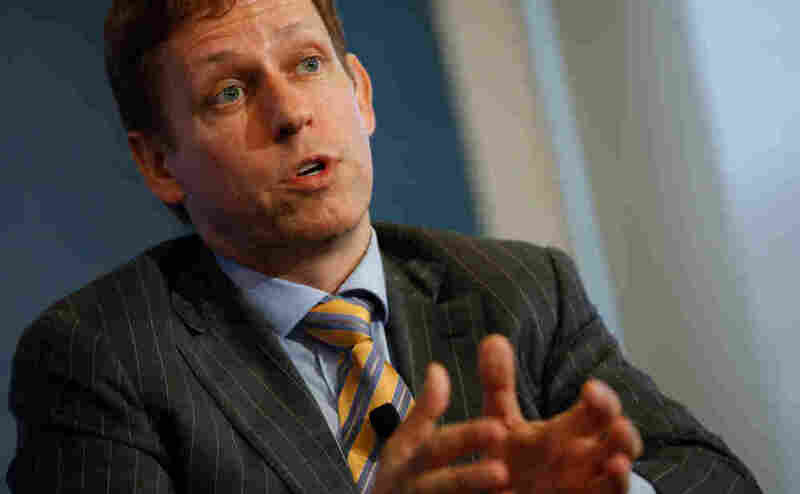 But his spokesman, Jim O'Neill, says Thiel believes Paul is the best candidate to beat President Obama. "There's a great opportunity to reach out to people who are concerned about civil liberties on the left, people who are concerned about deficits in the middle, people who are concerned about taxation on the right, people who are opposed to bailouts and bubbles," O'Neill says. "And so I think Paul would do really well against Obama." If that sounds like a long shot, keep this in mind: That's exactly what Thiel invests in. He's given money to a variety of long-term projects, from anti-aging research to "seasteading" — an effort to build communities on platforms in international waters. And he has said his support for Paul is the best bet for now to encourage a libertarian movement.